29 June 2010, at 8:19a.m. US - Joel Coleman, vice president and general manager of international sales at Butterball LLC in Mt. Olive, North Carolina, was elected chairman of the board of the USA Poultry & Egg Export Council (USAPEEC) for 2010-11. Mr Coleman succeeds outgoing chairman Don Ellen, manager of customer relations for Sanderson Farms in Laurel, Mississippi. His election came during USAPEEC's 21st annual meeting in Austin earlier this month. As chairman, Mr Coleman will head the eight-member USAPEEC Executive Committee, which sets policy and gives direction to USAPEEC, an organisation whose mission is to promote and increase exports of US chicken, turkey, duck and egg products worldwide. USAPEEC members also elected Thierry Murad of Atlanta, regional product manager for North American poultry at AJC International, as first vice chairman of the board, and Duane Rhodes of Springdale, Arkansas, senior vice president of international sales of Tyson Foods, as second vice chairman. Jim Hoben, vice president-poultry at Interra International, an Atlanta trading company, was elected to continue serving as secretary-treasurer of the organization. Hoben is a former two-time chairman of USAPEEC. Mike Little, international sales manager Mountaire Farms in Selbyville, Delaware, was re-elected chairman of USAPEEC's Market Development Committee, and Neil Carey of Simmons Foods will continue to serve as vice chairman. The chairman of this committee also serves on the board and has a seat on the executive committee. Rounding out the Executive Committee are Chaz Wilson of Grove Services, an international trading company with offices in Atlanta; and Jayson Penn of Case Farms as at-large members. 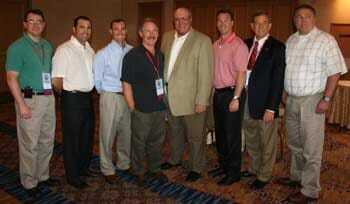 Following is the full slate of USAPEEC board members for 2010-11. In addition to Carey, Little, Murad and Wilson, directors with three-year terms ending in 2011 are Mark Barrett, Lamex Foods; Shea Carr, OK Foods; Ilona Kogan, Globex International; and Ron Vilas, Vilas & Co.
Board members with terms ending in 2012 are Coleman, Ellen, and Rhodes, along with Mark Blanchard, NOCS; Jennifer Leyden, Metafoods; Jay Maxwell, Jennie-O Turkey Store; David Radlo, Radlo Foods; Saher Rizk, Mirasco; and Jim Wayt, Intervision Foods. Board members with terms ending in 2013 are Hoben, Tony Burnes, DGM Commodities; Kristin Kennedy, Keystone Foods; Greg Meyer, Farbest Foods; Jayson Penn, Case Farms; Bill Sellari, Sellari Enterprises; and Charles Von Der Heyde, Pilgrim's Pride. Members re-appointed annually to the board are Kent Kleinschmidt, Illinois Corn Marketing Board; Brian Kreps, Corn Marketing Board of Michigan; Ralph Kaufman, Indiana Corn Marketing Council; Monida McCranie, South Dakota Research and Promotion Council, and Jim Schriver, United Soybean Board. New USAPEEC Executive Committee, from left, Mike Little, Mountaire; Chaz Wilson, Grove Services; Jayson Penn, Case Farms; Thierry Murad, AJC International; Past Chairman Don Ellen, Sanderson Farms; Chairman Joel Coleman, Butterball; Jim Hoben, Interra International; and Duane Rhodes, Tyson Foods.